You’ve come to Siem Reap because of the Angkor Archaeological Park, and it will fill every day for which you’ve purchased a pass. But what about after the park closes and for the days you need to rest your feet? The Park Hyatt Siem Reap: a chic big-city hotel in style and services, the Park Hyatt funds several community initiatives through the Hyatt Thrive program. Their initiatives include the aptly named Everything's Gonna Be OK and The Life and Hope Association. Life and Hope is run by monks at Wat Damnak. It provides educational opportunities and compassionate care, particularly for disadvantaged children and young women. A key initiative is the Park Hyatt Siem Reap Sewing School, which helps young women escape poverty and, often, abuse by giving them a marketable skill, hope and confidence. Sojourn Boutique Villas: a 10-minute drive outside of Siem Reap, this boutique hotel houses guests in spacious villas in a garden with a free-form pool. The Australian family that runs this quiet hotel does more for Cambodia than many other hotels combined. They created a charity, HUSK, which partners with three nearby villages to provide access to education, health care, and safe water, and to improve employment opportunities and the environment. They also provide their staff with the working conditions of a developed country and use more local and environmental products than they can list. Read more about the hotel at This hotel near Siem Reap is good for locals. The most popular non-temple attraction in Siem Reap is the Phare Cambodian Circus. Make sure you go on your first night, because you’ll love it so much you’ll likely want to go back and catch a different show. If you have time, arrive early so you can eat at the Phare Cafe too. Three-course set menus are available if you reserve in advance, and the à la carte menu includes Cambodian specialties like fish amok and beef kroeung. Phare runs schools providing skills, healing and eventual employment for at-risk Cambodian youth. They’re also revitalizing Cambodia’s arts, which were decimated under the Khmer Rouge. More than 1,200 students attend Phare’s public school daily, and almost half attend the specialty music, theatre and circus schools. By attending a Phare show, you'll contribute to these enterprises, but also have one of the best nights of your life. Each production combines spell-binding acrobatics with Cambodian history. The shows rotate throughout the week, so you’re likely to be able to see at least two. You'll wish you could bottle the energy of the performers as well as the feeling you'll get attending one of these incredible performances. After the show, you won't be ready for bed. Skip Pub Street entirely — the crowds and unruly behaviour will leave a bad taste in your mouth. Instead try the chic bar at Heritage Suites Hotel (especially popular for their Thursday cocktails and jazz evenings, if your weekend begins on a Thursday). Members of the city’s expat community are often found here, and you’ll learn all about Siem Reap’s NGOs and expat life while enjoying phenomenal canapés and cocktails. Breakfast is included with most hotel stays, but if you’re in need of additional caffeine or snacks, stop at Sister Srey Café. Not only do they have a vegan and celiac-friendly menu, but this is the home base of ConCERT, the Connecting Communities, Environment and Responsible Tourism NGO. If you want to volunteer or donate while you're in Siem Reap, ConCERT will show you how you can do it ethically without taking away jobs from Cambodians or supporting less legitimate organizations. Khmer food is delicious, but authentic dishes beyond amok can be hard to find in Cambodia, let alone in your home country. A cooking class is the best way to resolve this serious predicament. At Sojourn Boutique Villas’ cooking school, you’ll first visit a local family in nearby Treak Village to learn about village food customs and beliefs, and see how they grow their own food. Afterwards you'll return to Sojourn’s bamboo pavilion next to a fish pond and learn to make three to six dishes, and then feast on your creations. After your class and lunch, you’ll likely want a rest. How about a massage? If you were able to book an appointment at Sojourn’s spa, you’ll leave completely blissed out. If not, head back to town, but don’t settle for any old place. Massage can be found on almost every street corner in Siem Reap. Instead, choose an organization that provides work to some of the estimated 140,000 blind or visually impaired Cambodians. Seeing Hands Massage is one of the organizations that does not exploit its blind staff. Their Siem Reap location is on Sivatha Street (opposite Phsar Kandal). Ask at ConCERT or at Sojourn for other reputable blind massage centres. On most Saturday nights at 7:15 pm, Dr. Beat Richner performs a cello concert at the Jayavarman VII Hospital. Dr. “Beatocello” raises money for the city’s hospitals and for his Kantha Bopha Foundation for children. Attended by locals, expats and tourists alike, you’ll also have an intriguing peek into life in Siem Reap. Every second Saturday evening, the Shinta Mani hotel hosts a night market featuring products made by NGOs and other organizations supporting Cambodia’s disadvantaged. There’s often a Khmer performance of some kind as well, from singers to shadow puppets. After the concert, have a late dinner at one of Siem Reap’s hospitality training restaurants like Sala Baï, HAVEN near Wat Damnak, or Maroum. The schools target underprivileged students with a priority on young women, and are a key way of combatting poverty and human trafficking. By dining at the schools’ restaurants, you give students the chance to learn in real conditions and help fund their studies. You’ll be charmed by the smiling, shy service and enjoy deliciously prepared food. If your lunch was too big and you can’t stomach a sit-down meal, how about a street food tour? Unlike with Thai food, westerners are generally unfamiliar with Cambodian food and visiting Siem Reap’s street carts can be a bit intimidating. The RiverGarden Boutique Hotel street food tour takes a small group of eager eaters to street stalls near their river location and shows you how to eat like a local. They also provide cooking classes and full-day guided market tours. The RiverGarden supports a number of social enterprises. For example, if kids bring in a bag of litter they’ve collected off of Siem Reap’s streets, the RiverGarden will pay the fee for their English class at the Enkosa River School. If you’d like to try something beyond your hotel breakfast, you'll find an oasis of calm at New Leaf Book Café, near the Old Market and the river. This café, bookshop and restaurant donates 100% of its profits to projects supporting Siem Reap’s disadvantaged and vulnerable residents. On the menu are locally-sourced coffee, smoothies, cocktails and Khmer food, ideal for a visit any time of the day or evening. You'll find a selection of books in several languages, as well as talks and presentations on Khmer history and issues facing Cambodian society. Also near the Old Market is Wat Damnak. The wat was once a royal palace and you’ll enjoy the pretty pagodas and gardens on the grounds. If you’d like some handmade clothes and bags, pop over to the Park Hyatt Siem Reap Sewing School’s shop in the north corner of the grounds. If you make an appointment you can even be measured for bespoke clothing. The Center for Khmer Studies and library in the Wat Damnak complex are great sources of information in many languages, if both your heart and your head have been captivated by Cambodia. Before you leave town, see a little bit more of the non-touristy part of Siem Reap. Rent a bike and head out to the Cambodian Landmine and Relief Facility. The NGO was established by a former child soldier who later went back to the villages where he set landmines to diffuse them. By visiting the museum you'll learn more about Cambodia's history, as well as help the NGO raise money for landmine clearing and for the education of children who have been the victims of landmines. On the way back to town, stop at Mie Café for lunch. The restaurant is in a traditional Khmer house, and you can sit outside on the patio or in the garden (or inside with air conditioning if you’re a little wilted from your bike ride). Chef Pola Siv is known by Siem Reap insiders as one of the best chefs in the city. By patronizing his restaurant, you show that tourists will get away from Pub Street and their hotel to eat, and you’ll encourage other chefs who train abroad to come home to Cambodia. Trained at a Swiss cooking school and with experience at a Michelin-starred restaurant, Chef Pola reinvents Cambodian classics for his guests. Featuring foods from organic growers and local foragers, his kitchen serves two daily special menus as well as à la carte dishes. 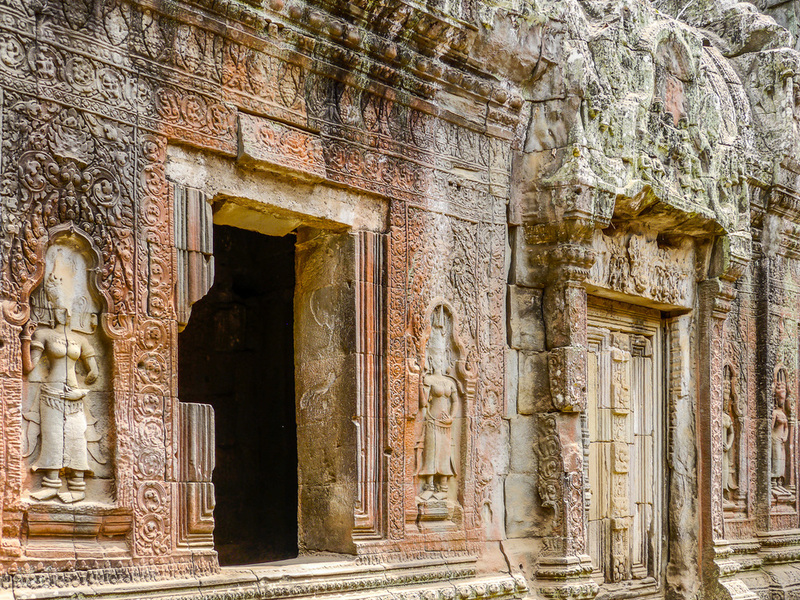 Flights from all over Southeast Asia arrive in Siem Reap multiple times a day. Visas are available upon arrival at the airport (bring a passport sized photo). If you’re very sensitive to the heat and dust, you might want to hire a car and driver. Otherwise, a tuktuk driver can take you everywhere you want to go, or you can just rent a bike. The ride to the Angkor temples is flat and has many shady spots. Like in many of the best tourism spots in the world, there are those who will take advantage of travellers in Siem Reap. With awareness, though, you should be fine. There are occasional reports of bag and phone snatchings on the street. Kids will approach asking you to buy their postcards or trinkets, or to convince you to buy a book for them or milk for their baby sibling. Don’t. You’d only encourage them (and their parents) that working is more lucrative than going to school. Most of the profits from your generosity will go to the cartel running the scam anyway, and not help the child. Stay away from orphanages too — children are not tourist attractions. Despite these warnings, Cambodia is an incredible experience. Problems are very rare and the Cambodian people are amongst the kindest and most generous in the world. Almost everyone falls in love here. Editor's note: The writer was hosted by the hotels listed and by Phare Circus. All opinions are the writer's own, and no one from these organizations reviewed or approved the article.